Nine weeks ago, I pruned all my repeat-flowering roses back so they’d flower on cue next weekend for our wedding. Then I had a panic attack about all the preparations… so we decided to change the date to give ourselves an extra fortnight to get everything done. I forgot to tell the roses not to rush though – and even then, some of them have shown up early. 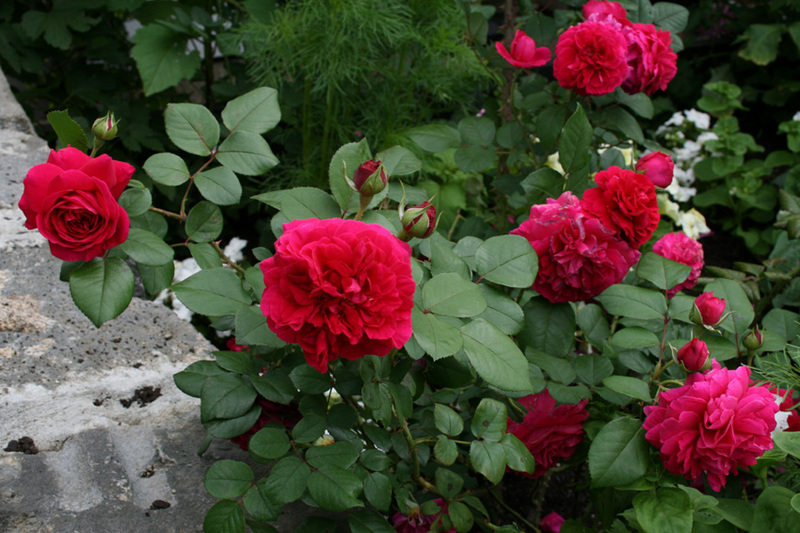 ‘Tess of the d’Urbervilles’ is looking glorious today. She’s smothered in beautiful crimson-pink blooms that are dripping petals all over the rock wall at the end of the stables. My photo just doesn’t do the colour justice – it’s bright, but in no way garish, and the foliage (which hasn’t been sprayed at all) is perfect too. ‘Tess of the d’Urbervilles’ is a fragrant David Austin English rose that can either be grown as a tall shrub or a short climber, though mine seems to be trying to be both. It has a compact shape at the front with a big spiky mohawk of tall canes at the back. Hi Lynda, you sure pick ’em… hope it’s not planted right next to Jude the Obscure for good measure! You HAVE READ those novels haven’t you??!!!!!! On that note – GOOD LUCK with a most wonderful wedding, it sure ain’t for lack of trying to get flowers, fields and lemonade stands and burgers going – I wish you both a lifetime of flourishing love and happiness… and fine weather to get your new married life off to a great start. Looking forward to hearing the updates in due course..
We did wonder about hiring a Mr Whippy van for the day. Soft serves and hundreds and thousands all round! But I figure that would just be tempting fate for the weather to turn chilly. Thank you for word press, emails, they make our week. we like the story about the bull and heifers, hope you have great wedding, and the garden will look great. We’re thinking about turning that bull into sausages. He’s getting a bit aggro, so everyone has been warned to keep well clear of him until after the wedding. We really don’t need more than one man in the bridal party in plaster! What a beautiful Rose.Just wish we could smell how fragrant it is.!!! Your garden must be a picture. A real credit to you.